The eye exam deserves particular attention, especially when there is periorbital injury. The exam should be performed early during the ED encounter, because, if not timely, progressive lid edema may prevent further examination. If lids are already swollen, lid retractors help visualize the globe. The bird's-eye and worm's-eye views help detect exophthalmos or enophthalmos. The pupil exam includes reactivity, and whether the pupils line up in the horizontal plane. A teardrop-shaped pupil indicates a ruptured or otherwise penetrated globe in patients without preexisting iridectomy. Examine for hyphema, although this usually requires a patient to be sitting. The presence of a hyphema correlates with significant visual loss. The Snellen chart, either standard or hand held, if feasible to administer, should be used to document visual acuity. If the patient cannot see the chart, record finger counting or, barring that, the presence or absence of light perception. Early recognition of traumatic optic neuropathy should trigger an emergency consultation, because timely decompressive surgery may prevent blindness. The best way to detect damage to the optic nerve or retina is the swinging-flashlight test. An abnormal pupil (Marcus Gunn) initially dilates (rather than constricts) when first exposed to a light that swings between both eyes. Subconjunctival hemorrhage is often present with periorbital fractures, and lateral hemorrhage frequently accompanies zygomatic fractures. Soft tissue bruising provides other important clues. Periorbital ecchymosis (raccoon eyes) result from a variety of insults, including basilar skull fracture, as well as direct trauma to the periorbital area. Fractures of the orbit, nose, and midface also produce raccoon eyes. In patients with severe periorbital trauma, measure the distance between the medial canthi. In average adults, the intercanthal distance should be 35 to 40 mm—or approximately the width of a patient's eye. Widening of this distance is called telecanthus and portends serious orbital injury. In patients with telecanthus, the bridge of the nose appears wide, but the distance between the pupils is unchanged. This is usually seen with naso-ethmoidal-orbital (NEO) trauma. A more serious condition known as hypertelorism occurs when the interpupillary distance increases. In this case, the orbits are dislocated and literally "blown apart." This devastating injury usually results in blindness. Extraocular motions must be evaluated for restriction. 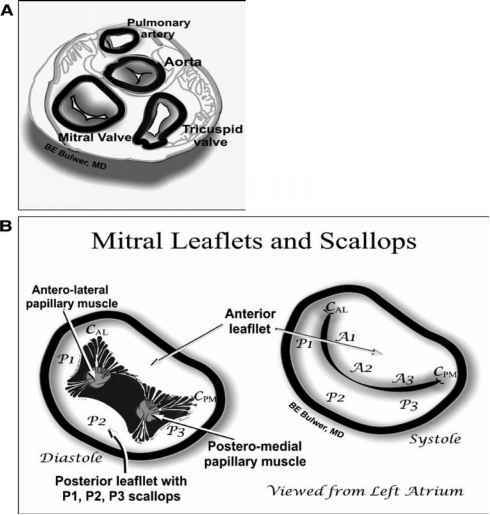 Fractures of the zygomatic and infraorbital floor frequently cause diplopia, especially on upward gaze. Significant pain with extraocular motions provides a clue to occult injury. One of the most important concerns is the status of the medial orbital area (the NEO complex). Consider this injury if the medial canthus is tender, or if the patient has telecanthus. When an NEO injury is suspected, the bimanual nasal palpation test is a helpful adjunct ( Fig. 249-2). To perform this test, anesthetize the nose with either cocaine or lidocaine. 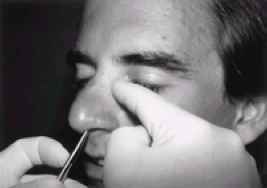 Then insert a clamp or long cotton swab into nose. Use the clamp or swab to press intranasally against the medial orbital rim (just inside the medial canthus). Simultaneously use the other hand to press the medial canthus. If the bone moves, the NEO complex is fractured.